Some recipes that you see are from my sweet friend Mary. We met in seminary and the girl has some great recipes. I use this one all the time. If you have preschoolers or elementary age kids you know how much you make cupcakes. 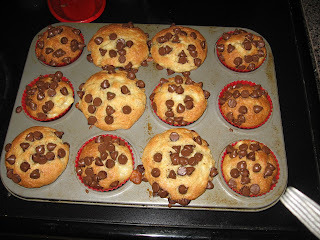 These are so moist and so easy and so fattening, but your making cupcakes c'mon!! Mix for two minutes with electric mixer. Bake according to box. Alternative idea: Make cupcakes as above, but serve with cool whip and strawberries for a delicious strawberry shortcake!! This is also a new recipe I got from my aunt! I love green beans and especially like this! The BBQ cups below are from me also!! Enjoy!! Boil green beans until dry. In the meantime saute almonds, lemon pepper, juice, and butter. When beans are dry add sauteed almonds and stir. I am sorry, but I can't just post a recipe without telling you a little bit about it. This is a new favorite. It was tested by everyone in the family and got two huge thumbs up!! Cook hamburger-drain fat. Add remaining ingredients, except biscuits and cheese. Press biscuits into muffin pan (I spread my biscuits to fill up 12 cups instead of 10). Fill with hamburger mixture and top with cheese. Bake 10-12 minutes at 400. Hey to everyone who reads this blog! Ok, I will not do this often at all(where I write...it will almost ALWAYS be recipes). BUT, you will think this is funny. I JUST now realized that people have commented on my blog!! On my other blog I get e-mails when someone comments so I just thought no one was commenting. I was really hoping someone was even reading this blog. So, I just got so excited because there were like 6 comments on this blog that I JUST found. Yay! It gives me inspiration to post more recipes. I hope some of you are actually making these things. Ha! I know how sometimes it is easier to just make what we know how to make. But, I have found a new found love for making new recipes. I am about to make a "hot chicken salad" recipe today. I will post if it is good. Ok, thanks for the support. :) Love y'all! Here is the catch about this recipe. You add mayo, salt, and pepper to taste. I would start with a cup of mayo. Add salt and pepper, mix it up with the cabbage and then taste it. But, after you add mayo and it looks creamy let it sit for a little while. It will get watery and taste like it has way more mayo in it after it sits. Put roast in the crockpot in the morning. Turn on low. Pour jar(s) of pepperoncinis over the roast. Cook until dinner that evening. This is SO good! It makes my mouth water thinking about it. I made this with homemade cole slaw. I will post that recipe after this one. Yum yum! Boil pasta just for a couple minutes and set aside in a colander. Put water back in your pot and start it boiling. Place pine nuts on a cookie sheet and place under broiler for roasting then set aside (they burn fast so be careful). Mince garlic and chop shallots, basil, parsley, and tomatoes. Put about 1/4 inch of olive oil in a skillet and heat on medium. Add the shallots and garlic, saute for a minute then add the parsley and basil. Put the pasta back in the boiling water and add tomatoes to the skillet (tomatoes do not need to be in for very long). Drain the pasta again and put in large bowl. Immediately before serving put the herb and olive oil mixture on top of pasta and toss. Add the pine nuts and the cheeses, toss again and serve. I just tried this recipe tonight and it was so good and so easy. Crush fried onions in plastic bag. Dip chicken into beaten egg; then coat in onion crumbs. Bake for 20 min. at 400 until cooked through. I made this with two pieces of chicken so I did everything by looking at it. I didn't use the exact amount. I also had corn casserole and steamed asparagus with it. Yum! Here is a recipe for some really good sweet tea. I make it all the time. Especially since we are located in Austin( hardly nowhere here serves sweet tea). This makes a gallon. Place 6 tea bags in a bowl of some sort that has 4 cups of water in it. Put in microwave for 6 minutes. Take tea bags out of water, then add 2 cups of sugar. Stir until sugar dissolves. Pour in gallon pitcher(sp?). Then add water to almost the top. Stir and serve. So good! Now! If you like sweet tea but want something with a little less sugar you can replace the 2 cups of sugar with 1 1/2 cups of splenda and 1/2 cup of sugar. Still really good! Chop Oreos either by hand or by food processor(WAY easier) until very fine. Mix oreos(I do it by hand) with cream cheese. Roll mixture into little balls(bite size). Heat up Almond Bark in microwave(follow the directions on the package or else you will burn it and it will ruin everything). Dip oreos in the chocolate. Let dry on wax paper. Hey ladies! Well, just wanted to let you in on a GREAT recipe that my mother-in-law shared with me. EVERYTIME I make it people go on and on about how much they love it. The other day, at a neighborhood block party(where I knew no one) someone called me the corn girl and asked everyone to give me a round of applause for the corn casserole that I made(and they did). Ha! So, definitely try this one. You will LOVE it! Mix all the ingredients together(I would highly recommend using a mixer...not by hand). Spray a small pyrex dish(unless you double the recipe, then use a 9x13). Pour the mixture into the dish. Bake on 400 for 45 min-1 hour. Take out when it is a little brown. Preheat oven to 400. Prepare mac and cheese as directed on package. While mac and cheese is cooking, brown meat, drain. Add taco seasoning and water to meat; simmer 5 min. Stir sour cream into mac and cheese. Spoon half of mac and cheese mixture into 8 inch square or 9 inch round backing dish; top with layer of meat mixture, 1 cup of cheese and remaining mac and cheese mixture. Cover. Bake 15 minutes in oven. Then top with salsa and remaining shredded cheese. Bake uncovered for 5 additional minutes or until cheese is melted. Can also top with tortilla chips along with salsa and cheese. I just made this last night. I actually continued doing layers until all my mixtures were gone. It definitely does not have to be perfect. I would also recommend serving it with rice and/or beans. ENJOY!